Bluetooth, as a wireless technology, is very useful because it allows you to connect nearby devices to transfer files and share data. If a computer is Bluetooth-capable, it will do a great help in your daily work. However, how to know if your computer has Bluetooth built in? In fact, most of the newer laptops come with Bluetooth hardware already installed, but if your computer is much older or if you are using a desktop, chances are lower. Here is the workable way to find if the computer has Bluetooth. Note: Try Driver Talent (formerly called DriveTheLife) to download or update Bluetooth driver for your desktop or laptop. How to Tell If Your Computer Has Bluetooth (Windows 10/8.1/8/7/XP/Vista)? The method below applies to Windows OS, such as Windows 10, Windows 8.1, Windows 8, Windows XP, and Windows Vista, either 64-bit or 32-bit. 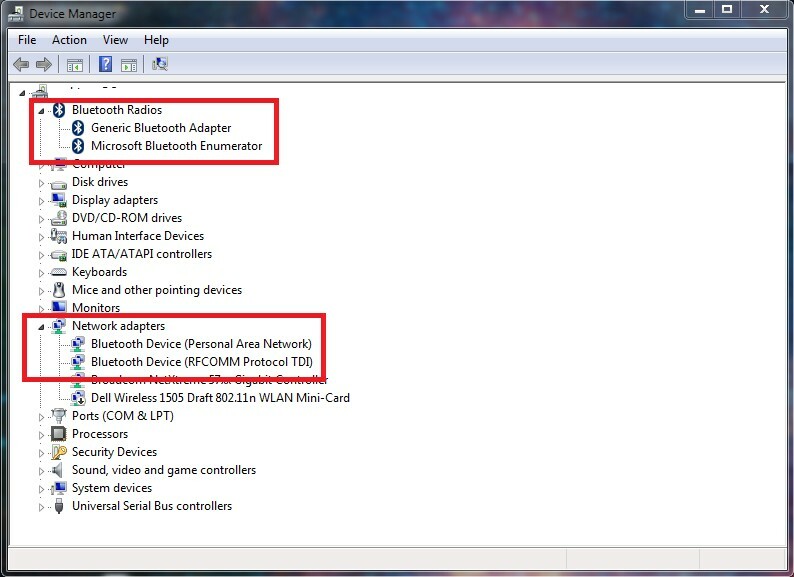 The Device Manager will list all of the hardware in your computer, and if your computer has Bluetooth, it will show the Bluetooth hardware is installed and active. Here are how to access the Device Manager. Step 1. Swipe in from the right edge of the screen, and then tap “Search”. Step 2. Enter “Device Manager” in the search box, and tap or click “Device Manager”. You may be asked for an admin password or to confirm your choice. Step 3. Expand the Bluetooth Radios category. You will see the Bluetooth hardware listed there. If there is a yellow exclamation icon other the hardware, you need to install the proper driver before the Bluetooth will work. See how to install or update the best-matched Bluetooth driver. Step 4. If you don’t see the Bluetooth Radios category, find your Bluetooth adapter in the “Network adapters” category. It normally contains your network card that you use to connect to wireless or wired networks. If you don’t have Bluetooth hardware installed on your computer, you can buy Bluetooth USB dongles from Amazon or from other retailers. Just a few dollars. Please note that all Windows Server versions don’t have in-box support for Bluetooth wireless technology. And Windows supports Bluetooth version 1.1 and later. Here are the details. Access your windows applications at an ease of single click on any device with high performance Citrix Xendesktop VDI from CloudDesktopOnline. Try out Hosted SharePoint, QuickBooks Pro Hosting, MS Azure from Apps4Rent for enhanced productivity. Surprisingly my brand new HP Pavillion does not have Bluetooth. Thanks for helping me discover this. Thank you. but mine toshiba satellite laptop and there is no bluetooth driver, I am still checking on multiple forums. I am trying to setup a Fitbit Charge 2 using a PC with Windows 10. When I could not get the setup program to recognize the dongle, I cancelled the setup to go look for help. I performed a search through the device manager and determined that I do not have a Bluetooth driver. When I assembled this desktop computer 6 years ago, I did not envision needing Bluetooth and when I upgraded to Windows 10 last year, I still did not see the need. Please let me know what I need to do to be able to set up and use the Fitbit Charge 2 that I received as a Christmas present. This help article is not sufficient to assist me. After changing window 8 to window 7 i lost my bluetooth. So what should i do? I simply wanted to type a quick message in order to thank you for some of the great techniques you are showing at this website. My particularly long internet lookup has now been rewarded with reputable knowledge to talk about with my relatives. I would repeat that we site visitors actually are undoubtedly fortunate to exist in a good site with many wonderful professionals with great basics. I feel rather happy to have discovered the website page and look forward to tons of more cool moments reading here. Thanks once again for a lot of things. I have Bluetooth but my charge 2 has an error message that says my hardware may not be compatible with Bluetooth LE. Is there a driver I can update? Hi Jose. You could go to the Device Manager on the Windows to find your Bluetooth device and update the driver, or use Drive Talent to instantly update or repair the Bluetooth driver. I have all Bluetooth drivers updated and computer updated. Windows 10 64 bit. Charge 2 doesn’t wanna sync to computer. I have the right drivers, windows 10, bluetooth, ability to read and understand simple directions – NOT FINDING MY ZIP SITTING 2 inches away with NOTHING around it. Bout ready to scream. please help me set the correct time. My tracker is not giving me MST. Hi. You could go to the Service and find Windows Time. Double-click the service and click the Start button. Make sure its Startup type is Automatic. My Laptop has Bluetooth but it won’t allow me to send files from it. Receiving files works just fines but there is no option to share the computer’s files with other devices by using the Bluetooth. Anyone knows what’s up with that? My Laptop has a Bluetooth but I find difficulties using it. My laptop has Bluetooth but I didn’t test it yet, maybe I will try sending files to my phone from the laptop.